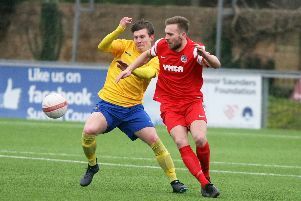 Former Welling defender Joey Taylor has rejoined the club after leaving for Bostik League South East Division rivals Hythe Town in February. Having joined the Hornets in the summer, he was finding game time limited and made the switch to ensure he was playing regularly as to continuing playyng for Montserrat in their CONCACAF qualifying matches. With those now over, Horsham manager Dominic Di Paola is delighted the full-back has returned to finished what he started. Di Paola said: “He has come back to us after the internationals. Hythe has shrunk down their squad as they don’t have much to play for. “He called me and asked if we would want him back and of course I said yes. “He is someone we never wanted to leave and he has been a part of the team over the season all the way from pre-season. Kieran Lavery, who was away last weekend, will be back for Saturday’s trip to Sittingbourne. Will Miles was on the bench last weekend as he continues his return from his latest hamstring problem. Di Paola added: “He has missed a lot of football and is one of those that is chomping at the bit and desperate to play all the time.